Dozens of firefighting teams work to bring fire in supermarket under control, call in teams from other areas to help. 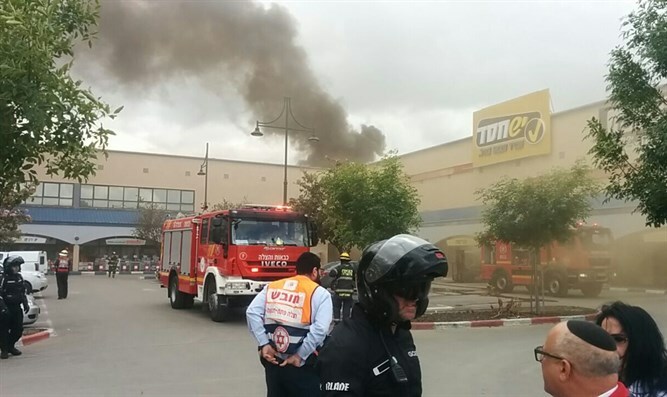 Dozens of firefighting teams were called to national religious Kibbutz Be'erot Yitzhak near Petah Tikva, after a fire broke out at the Be'erot Yitzhak supermarket. The firefighting teams currently on the scene are concerned the building's ceiling will collapse, and are looking for people who may be trapped inside. Dense smoke made the firefighting operation difficult, and the fire has not yet been brought under control. The Israel Fire and Rescue Authority has called all available firefighting teams from the Central District to help fight the fire. Other firefighting teams from neighboring districts have been called in to help as well. It is not yet clear what started the fire.